I’ve mentioned before that up until a few years ago my parents rented a cottage off Lake Memphremagog every summer. It was a beautiful place. The cottage was right on the water, we would sit on the dock with a cup of coffee and enjoy the sights and sounds. To me there is nothing more soothing than the sound of water lapping the shore. Around the cottage there were woods and trails. Before 9/11 you could wander through the woods and accidentally end up in Canada. The woods are much more heavily guarded now. Things change. Since we stopped renting the cottage I’ve been to Vermont a handful of times. So when a friend of mine posted on Facebook that she had booked a trip to Burlington and could no longer go, I jumped at the chance to buy it from her. My mom and I drove down Sunday afternoon. We stayed at the Essex Inn and Culinary Institute, about 15 minutes from downtown Burlington. Although the inn is nowhere near water, it immediately reminded me of the cottage. The air was crisp and clean, surrounding the inn are woods with hiking trails. Sadly, the trails were washed out by Irene, with trees blocking several paths. This was one of the first signs that Vermont is still recovering from the storm. Our original plan was to spend one day in Burlington and to spend another driving around Vermont. Burlington is lovely. It’s a small city, but there’s so much to do. We shopped the Church Street Marketplace, enjoyed some local chocolates from Lake Champlain Chocolates, and ate at Leunig’s Bistro. In the afternoon we walked to the Lake Champlain Waterfront, where we met a couple from Kent, England. These very kind people highly recommended the boat tour of Lake Champlain, unfortunately we didn’t have enough time to take it. My favourite part of the trip took place Monday evening. We had dinner at the Inn then went for a walk around the grounds. It was a cool night which I wasn’t dressed for and I was about to suggest we go back inside when we saw a bonfire being built. We decided to sit by the fire to warm up. We were joined by an eclectic group of Inn guests, and soon we were roasting marshmallows and all singing along to John Denver songs by the fire. It was a wonderful night and highlighted what I like most about Vermont: the people. We changed our plans to drive around because of the roads and bridges that are still washed out. Vermont was hit unexpectedly hard by Irene, and they are still recovering. In addition to washed out roads, there are people who have lost their homes, farmers whose crops were destroyed. The photos of the damage are heartbreaking. El of Fresh New England has set up a page for those of you who would like to help here. She’s also asked that we make Love Vermont Chocolate Fudge Cake . I chose to make brownies instead, although I didn’t follow El’s recipe, these brownies were made with love. Over a double boiler, melt the chocolate and the butter together, stirring until smooth. Let cool slightly, then stir in the sugar, followed by the vanilla. Stir in the eggs 1 at a time, then add the flour and salt. Stir until no traces of flour are visible, then add the chips. Pour into a greased 8×8 baking pan, then bake for 22 to 27 minutes until a tester comes out clean. The longer the brownies are baked, the more cake-like they will be. Vermont is my home state… love and miss Vermont and the people. Your brownies look wonderful. I love brownies almost as much as I love bacon. Thank you for sharing these gorgeous pictures! 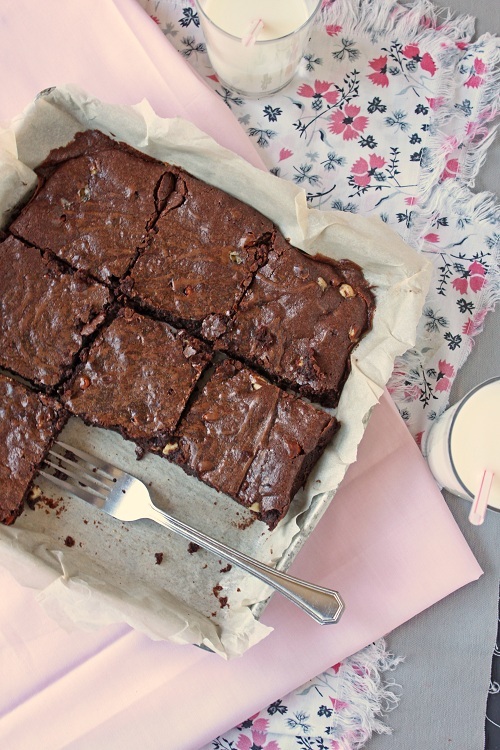 If there’s one thing I love more than cake, it’s brownies. Love the idea of maple chips! Definitely trying this. They look fantastic. What a simple but delicious looking recipe. Happy Baking! Thanks for writing this lovely post. Admittedly, I got a bit teary eyed around the campfire part. Lovely recipe too. Only been to Vermont once…loved it. Thanks for sharing your special time there and it is definitely time to show Vermont some love. I don’t know it well but it definitely follows its own vibe and I love that about it. Never been to Vermnt , But I definitely Love these Brownies! Love chocolate and everything about ti!!! Great post! I’m a Vermonter, actually live 8 minutes from where you stayed. Glad to see you loved your stay and are sharing all the wonderful memories. On your next visit you should come during maple sugaring time and get some good syrup and maple goodies. You should also check out Cold Hollow Cider Mill for the best apple cider donuts! There is all kinds of inspiring food stuff here in Vermont. Thanks for the tips! I’m already dreaming of apple cider donuts! P.S. Where can we find maple chips? Not sure I’ve ever seen them before…. I saw John Denver in concert in Vermont when I was little (ok,well a teenager, but I’m not admitting that our loud). My family and I are kind of John Denver around the campfire dorks too! Fudgey with a nice crust on top?! Beautiful! Looks like the perfect brownie recipe. Your trip to Vermont sounds so lovely. One of the bestest things to come out of that state is the Lake Champlain Chocolate company. Best chocolate in the world. Your brownies look pretty close, though too! I love the thought of wandering about the woods, only to wind up in Canada. Considering the armed guards that may now be present, I am all the more thrilled and intrigued by this prospect. Vermont was beautiful this weekend. I wanted to stop at LCC to seek out the Grace Potter chocolate bar (although I think they may only sell it online), but instead stopped at a friend’s farm – which had been destroyed by the flood waters. All of their produce, destroyed or unsellable. They weren’t terribly distraught, which was encouraging. Good people, those Vermonters! Vermont is one of the places on my list to visit if ever I’m in the US. 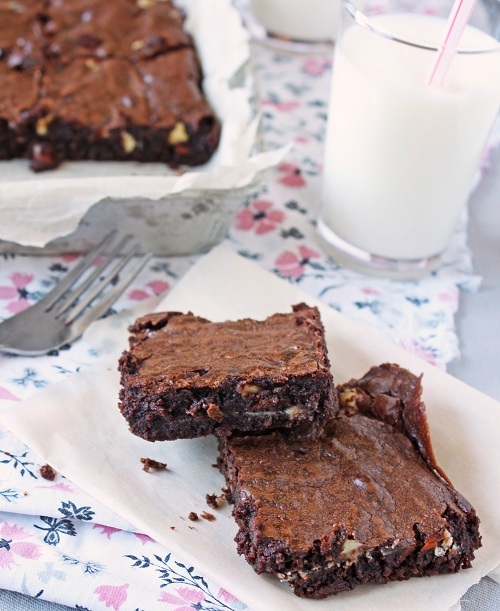 Your fudgey brownies look divinely decadent! For now, I’ll start making this lovable Choco fudge brownies. I’ll be adding nuts to personalize it a bit. Plus, there’s a lot of nuts in my cupboard that I need to use. Le mien ne m’avait rien demandé mais j’ai préféré prendre de bonnes habitudes alimentaires avant l’opé et j’ai perdu 20kg toute seule avant mon mini bypass.